In places where the season’s change, we’re fastly encroaching on fall, in Deltona however, we have quite a bit more warm weather before switching our HVAC from AC to heat! It’s never a wrong or bad time to schedule an HVAC service in Deltona —review our checklist to keep your home comfortable and in optimal conditions. If you’re sitting in a nicely cooled home, you can thank a properly maintained HVAC system! At Air Nation, we can’t change what’s happening in the outdoor environment, but we can ensure your home is appropriately cooled and heated in the changing seasons. Follow along in today’s post and review our annual fall HVAC checklist! The most valuable equipment in your home isn’t found in the kitchen, it’s your HVAC system! 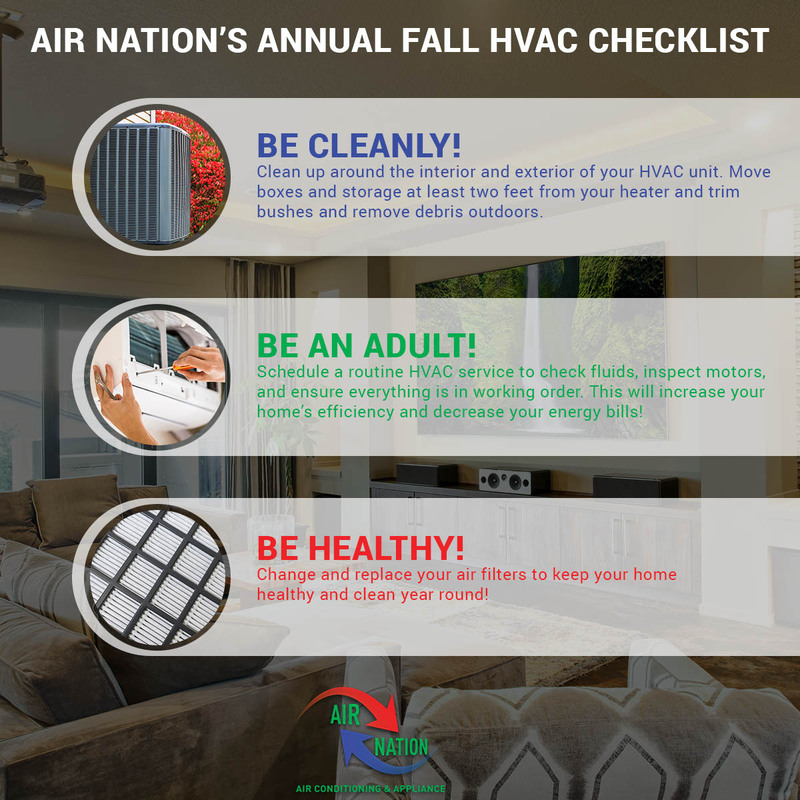 The Fall Annual HVAC Checklist is Here! If you’re feeling the slight transition from triple-digit weather to a crisp mid- and high 80s in Deltona, you may want to review our fall checklist and ensure your home is ready to combat the frigid 70s we often see in the fall and winter! Count the days when you transition from your Deltona air conditioning to heating, and begin with our checklist! During the summer we’re trying just to beat the heat and stay cool, so the AC is continuously running and we’re likely indoors in our AC sanctuary — this leaves little time to assess what’s going outdoors! Take a moment and see what the outdoor portion of your HVAC looks like. Does it need to be cleared of any bushes, or does it look dirty? As the weather cools, take the time to clean up your HVAC and ensure proper airflow is available. In the interior, move excess storage and sky-high stacked bins from your away from your heater, and give it ample space. When there is at least two-feet from your HVAC, it keeps things running efficiently so your home can be heated and cooled properly. Heating and cooling your home typically accounts for half of your energy bills each year, if your home is a part of the average. When you take preventative measures and schedule HVAC maintenance, it can boost your home’s energy efficiency and lower your energy bills. HVAC technicians will look closely at the indoor and outdoor HVAC units, check fluids, and inspect motors to make sure everything is running as efficiently as possible. Not only is the HVAC responsible for heating and cooling your home, it is responsible for keeping the air clean and fresh. And because Deltona residents often run their HVAC year round, the air can become congested and in need of a filter change. You can schedule this HVAC service, or take make it a DIY project. It may be useful to learn how to do it yourself because changing the filter more often keeps the air cleaner and healthier. If you have a senior HVAC system, you may want to consider a replacement before the fall and winter weather settles in. 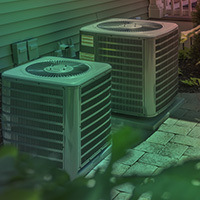 HVAC systems were not designed to last forever and if you’ve had to make a lot of repairs in the last year or so, an investment on a new one is well worth its price in comfort. Running heat without scheduled maintenance can be downright dangerous, in addition to costly. If there are any gas leaks or carbon monoxide issues, your health and home are in jeopardy. Prevent safety issues and have your HVAC serviced by the experts. When the cooler weather hits, this is a great time to reset the temperatures in your thermostat. The weather is often unpredictable and ever fluctuating, so you may have to reprogram it a couple times during the week. This is a great time to look into a smart thermostat which controls the heating and cooling of your home based on the outside temperature. 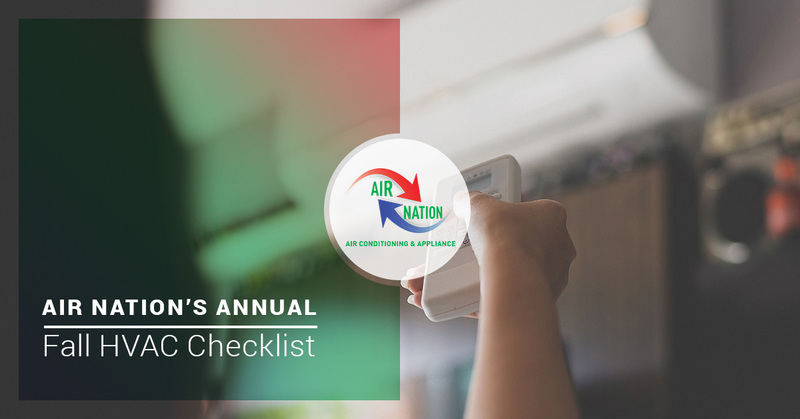 With the changing seasons, fall is the perfect time to get your HVAC serviced and run through our annual checklist to ensure your home can keep you toasty and warm in the cooler temperatures. To check off a scheduled HVAC service, call us today!